A new role for Firefly's Nathan Fillion gives him a little bit more geek cred. Ever since Nathan Fillion jumped onto the scene in Joss Whedon's beloved Firefly, for various reasons fans everywhere have been mentally casting him in movie and television roles across the board of geekdom. Finally, Fillion will be taking on a role that should make those fans happy. 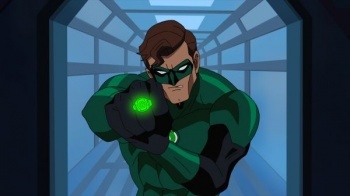 He's going to be the new Green Lantern, almost, as a voice actor in an upcoming animated film. No, Fillion won't be taking Ryan Reynolds' spot in the live-action Green Lantern movie franchise, but he will be playing Hal Jordan in Green Lantern: Emerald Knights releasing on DVD June 7, 2011 from Warner Bros. Animation. That's almost as good, right? Fans have wanted Fillion to play roles such as Nathan Drake in the Uncharted film and Ant-Man in the Avengers movie, for naught. Fillion's latest role might not be ideal, but I think it's a step in the correct direction. "Now I feel like I own a little piece of Green Lantern," he told TV Guide. Now that Fillion has some sci-fi cred from Firefly, some videogame cred from voicing characters in Halo 3: ODST and Halo: Reach, and comic book cred by voicing the original Green Lantern, you figure he's got to be up for another geek-related role where he actually shows his face. Maybe he can play Guy Gardner in Green Lantern 2.